As my Mahler quest is going well, I now want to turn my attention to Anton Bruckner and in particular his Symphonic music. With that in mind are you prepared to recommend recordings of his Symphonies that are still available that I should try and get? I have copies of his Fourth and his Seventh with von Karajan and a splendid version of his Sixth with Klemperer. I have so many but I am a big fan of the last Gunter Wand cycle and the Georg Tintner NAXOS cycle. Rattle is very good with a fairly recent 4th symphony. 4: If you already have Karajan/EMI, you have one of the better ones. If you want to try something more aggressive, and also with the BPO, try Jochum's recording on DG. Jochum/Concertgebouw, live from 1986 on Tahra. I see they have it used on Amazon, although it's a bit on the expensive side. I also love both Karajan/BPO on DG and Sawallisch/Philadelphia. These later two are not currently available individually on CD I believe (although you may be able to find the Karajan coupled with the first symphony on two discs), but both are available as downloads if you do that. The Karajan is on DG's download site and the Sawallisch is at www.thephiladelphiaorchestra.com. One that some people like a lot, and I like it, although not quite as much as the above, that has similar tempos to those, but which will be much easier for you to find on CD is the Thielemann/Munich Philharmonic recording on DG. Sinopoli/Dresden on DG is another good one. For a faster, more aggressive approach, there is Welser-Most/London Philharmonic on EMI. 6: The Klemperer that you have was the first Bruckner recording that really clicked for me. It's a great introduction to this symphony, but since then, I have come to love the Celibidache on EMI to the point where I'd probably call it my single favorite Bruckner recording and one of the jewels of my entire CD collection. The phrasing and sound are just wonderful, and only the second movement is substantially slower than average. I see they have one used one at Amazon for not such a bad price. 7: You said you have Karajan, and both his EMI/BPO and DG/VPO recordings are among the best. You may also want to try Matacic/Czech Philharmonic for a more aggressive approach. 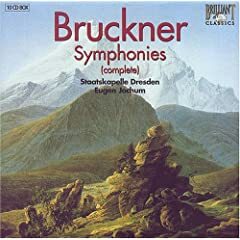 8: This might be my favorite Bruckner symphony, but I have a tough time picking a favorite commercial recordings for it (I've heard a number of tapes of live performances that have blown me away). Among commercial recordings, a couple favorites are Karajan and Giulini, both the VPO on DG. Again, for a more aggressive approach, I recommend Matacic, this time with the NHK Symphony. 9: Giulini/VPO is my favorite. His CSO recording is also a nice one, as are Jochum/BPO on DG, Karajan's 60's BPO recording on DG (he made one in the 70s for them too I think), Kubeli/BRSO on Orfeo and Furtwangler/BPO. As I've alluded to, there are two distinctive Bruckner styles. While certainly some people like both, it's not unusual for someone to prefer either the slower approach, with more blended, almost organ-like textures (some people call this the cathedral style of Bruckner performance), or an aggressive approach, with faster tempos and often more blaring brass and less blended orchestral textures. You may want to get one of each for a few of the symphonies and decide which approach you prefer or if you like them both. Last edited by Barry on Wed Feb 06, 2008 5:55 pm, edited 5 times in total. Bruckner's Symphony No. 7, however, is my all-time favourite work of his. Having heard many recordings on LP and CD, I always turn to the Furtwängler EMI/Electrola/Dacapo recordings that have been available. This was/is available on a privately issued recording as well a live 1949 performance with Knappertsbusch and the VPO. Oswald Kabasta conducted a fine performance from 1942 with the Munich Philharmonic, once available on Electrola. Another live recording (1963) with Knappertsbusch and the Cologne Radio Orchestra (availble on CD) is also worth a hearing. Recordings by Schuricht, Bruno Walter, Böhm, Abendroth, Horenstein, Jochum and several others would prove to be more than mere satisfactory performances of just about all the Bruckner symphonies.What a "dark" composer he was! Ralph's right about Gunter Wand and George Tintner's cycles...Wand is exceptional and the Tintner's are attractively priced...and Eugen Jochum has a good cycle on DG also..
My favorite Bruckner symphony is the fourth. My favorite recording is with von Karajan, but I only have three recordings (one was out of a collection I bought at a supermarket...) In this collection there was a good 8th symphony recording with the Berliner Philharmoniker under the direction of Wilhelm Furtwangler. 7. Furtwangler or Bohm. Don't like Karajan in this: turns the adagio into sludge, IMHO. The Celibidache is one of the few recordings I've thrown away. 8. Wand. The unavailable recording, unfortunately, although the available rec is also superb. I also like Boulez. Skrowaczewski's Saarbrücken Radio Symphony Orchestra traversal is overall excellent as is Tintner's as already mentioned. Thanks for going to the effort to respond to my request and in particular to Barry for such a comprehensive and informative response. Donaldopato wrote: Skrowaczewski's Saarbrücken Radio Symphony Orchestra traversal is overall excellent as is Tintner's as already mentioned. yup - the Konwitschny/Gezundheit Staatskappelle version of Bruckner's Sym #000 is the greatest ever, a must have!! Heck148 wrote: yup - the Konwitschny/Gezundheit Staatskappelle version of Bruckner's Sym #000 is the greatest ever, a must have!! I think Jochum is fine for at least the first three; I enjoy the old Walter/Columbia Sym. for the Fourth most, the Fifth is excellent (as Lance stated) with Knappertsbusch VPO (and the cymbals at the end! ), Klemperer hands down for the Sixth, and the Seventh with Tintner or Böhm is wonderful. The Eighth again with Jochum, but I haven't heard Tintner's. I also still love Bruno Walter for the Ninth. I believe I mentioned once that I experienced LIVE (front-row center) in the Cathedral in Speyer the Ninth conducted (in 1972) by Celebidache with the Stadtsphilharmonie Rheinland-Pfalz. He had to take it pretty slowly because of the echo! The Scherzo was mind-blowing---a wonderful experience! I enjoy Tintner in the early symphonies. Klemperer has always been one of my favorite Bruckner conductors, and I have most of his recordings in symphonies 4-9. There is only ONE #6...Bongartz/Gewandhaus! Pity the ears that have not heard it. david johnson wrote: There is only ONE #6...Bongartz/Gewandhaus! don't forget Klutzdorfer/Gezundheit from 1935. an epic struggle!! #6 - Solti/CSO - hands down, a great recording - electric excitement right from the edge..
My favourite set is Chailly on Decca with the Concertgebouw orchestra and the Deutsches Symphonieorchester Berlin (Not to be confused with the Berlin Philharmonic, but still a very fine orchestra). 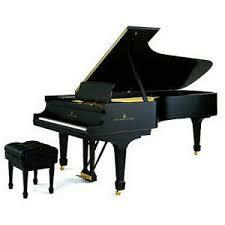 Very good playing throughout and superb sound. Number four is somewhat disappointing, but you already have a very good recording of that symphony. Among the symphonies you don't own, nos 2,3,5 and 8 are excellent. No. 2: Bruckner's most underrated symphony. I have a number of very different recordings and would not be without any of them. Chailly (Concertgebouw, Decca), Giulini (Wiener Symphoniker, Testament), Karajan (Berlin PO, Deutsche Grammophon), Tinter (National Orchestra of Ireland, Naxos) and Wand (Cologne RSO, RCA). The latter is Wand's only recording of this symphony (i think). It is part of a box set, but i have seen it on a separate disc as well. No. 3: For a short version: Haitink and the Vienna PO (coupled with number eight, also very good. Two discs at the price of one). For a long version Tinter on Naxos will do. I haven't checked out Vänskä on Hyperion or Nagano on Harmonia Mundi, they both have their admirers. No. 4: Boehm and the Vienna PO (Sometimes coupled with no. 3 on a double CD. I haven't heard the latter, but some people have that recording on top of their lists as well). No. 5: Apart from the ones already mentioned: Harnoncourt and the Vienna PO (RCA) and interestingly: Ormandy and the Philadelphia Orchestra. A very good bargain. Ormandy has recorded no. 4 also and it was mentioned in a Gramophone article about neglected recordings. No. 6: Staatskapelle Dresden and Eugene Jochum (one of the highlights in this set which is a little uneven in my opinion). No. 7: Wand and the Berlin PO is my favourite so far. But i am still looking for the perfect 7. No. 9. Herbert von Karajan and the Berlin PO is very good. But i have heard excerpts from the DVD with Bernstein and the Vienna PO and that sounded sensational. Has anyone seen the entire performance? Does anyone else here have a problem with Solti as Bruckner interpreter? To me, his conducting often lacks warmth and spirituality. It's a lot of big guns, great sonics, sometimes even pushing the music too hard. Sure, it's intense....but exactly Bruckner---more even than other late 19th-century symphonists---needs a more reflective, soulful approach. Jack Kelso wrote: Does anyone else here have a problem with Solti as Bruckner interpreter? Some of it has to do with the differences between European and American brass instruments. European instruments are constructed in such a way as to "burnish", or take the sharp edges off the sound whereas American instruments usually sound harsher. I read somewhere that to a certain extent the differences in sound is caused by the differences between rotary valved and piston valved instruments. The first recordings I heard of Bruckner symphonies were Eduard van Beinum's with the Amsterdam Concertgebouw Orchestra, starting with #7 and also including #8 and #9. I also heard them play the Seventh in concert in the '50s. These are fairly brisk (by Bruckner standards), objective performances, but with a strong sense of drama--the 8th in particular has an impact that I've heard since only from Solti, whose Bruckner is much too "punchy" and, well, Soltiesque for me. Though van Beinum made many records with Philips when it was chiefly a Dutch company, his reputation seems to have faded pretty quickly after his death, but I still count him as among the most musical and alive conductors I know, and I've kept those van Beinum LPs from Bach to Bartok that I bought in the '50s and '60s. John F wrote: The first recordings I heard of Bruckner symphonies were Eduard van Beinum's with the Amsterdam Concertgebouw Orchestra, starting with #7 and also including #8 and #9. I also heard them play the Seventh in concert in the '50s. I share your enthusiasm for van Beinum, although I haven't acquired or heard all of his Bruckner. I'm not really that knowledgeable a Bruckner fan, but...well, I know what I like. And one thing I like a LOT is the live Bruckner symphony #5 in the old Philips "Art of Eduard van Beinum" LP box set...a three-LP-sides mono recording that's open, airy and lifelike. While the sound is seductive, so too are the flow, pacing and obvious affection and skill with which the music is being played. Since I do not read musical scores I cannot comment on technical accuracy, just on the joy I encounter when listening to this performance. Fact is, that entire box set is one of the finest representations of van Beinum's career that I can imagine. In addition to the live Bruckner and among many other fine performances (and, well, one or two oddities), it offers what is still the finest Mendelssohn "Italian" symphony that I've ever heard. I generally prefer the top European orchestras for Bruckner, as my picks indicate. One exception though is that Bruckner 5 download by Sawallisch/Philadelphia. It's amazing how European he had them sounding. It was a completely different type of sound and approach from what you normally hear from orchestras like Cleveland, Chicago and New York. I certainly don't doubt that the makeup of the instruments has a lot to do with it, but conducting approach also matters. And yes, as I mentioned before, I have that same problem with Solti's Bruckner. A live performance of the 5th was the event that turned me into a Bruckner fan. I prefer digital simply because of all that pizzicato and pianissimo passgaes! I found Harnoncourt's Wiener recording and Sinopoli's Dresden recording to be absolutely spot on in their very own way. According to most sources though, van Beinum and Jochum's 5th, both made with the Concertgebouw, is a must hear for all fans of the 5th symphony. How true is that i have no idea, because i can never get hold of them! I recently acquired an older recording of Harnoncourt conducting the 7th with again, the Wiener Philharmoniker, onm Teldec and enjoyed it a great deal. I was very happy with how he shaped the overall line of the piece, yet not abandoning tiny details, and that rhythmic drive, oh man! There are so many good recordings of Bruckner symphonies out there like you pointed out. To me he is the most under rated and neglected composer of the romantic period, shadowed by Mahler's success which is apparent today. Seán wrote: As my Mahler quest is going well, I now want to turn my attention to Anton Bruckner and in particular his Symphonic music. With that in mind are you prepared to recommend recordings of his Symphonies that are still available that I should try and get? You already have some fine readings, but I'll recommend some of my favorites. I really enjoy Haitink's cycle with the RCOA. It's fairly reasonable, the sound is good, and there are no poor performances. You'd probably want to hold onto the Bruckner you have, because the Klemperer is arguably the finest Sixth ever, and the Karajan ones are superb, too. (My only problem with Haitink's 60's Bruckner 7th in his set is that it is soundly beaten by his late 70's remake.) Still, the 8th is VERY fast in the first two movements, and very exciting. His Ninth has a timpani pulse at the end of the 1st movement unlike any other rendition I've heard...except for Haitink's 80's remake. Very electric. #9 So many choices: Karajan 60's or 70's, Haitink, Barenboim (either CSO or BPO), Giulini (VPO), Skrowaczewski either Saarbrucken or Minnesota. Perhaps the Minnesota one is the coolest because it is the only one I've ever seen with tracks within movements. Walter's Columbia account is justly praised, but I do wish the playing was a bit better. Wand has done several fine versions of this, too. John F wrote: The first recordings I heard of Bruckner symphonies were Eduard van Beinum's with the Amsterdam Concertgebouw Orchestra, starting with #7 and also including #8 and #9. I also heard them play the Seventh in concert in the '50s. These are fairly brisk (by Bruckner standards), objective performances, but with a strong sense of drama--the 8th in particular has an impact that I've heard since only from Solti, whose Bruckner is much too "punchy" and, well, Soltiesque for me. I have Van Beinum's 5th, 8th and 9th and his Bruckner is great. Intense but still singing. And I sahre your opinion of van Beinum as a conductor in general. His stock is pretty high at the moment, Philips having re-issued 11 CDs in two boxes here in the U.S. and many of his recordings are available in Japan. I love the 8th in particular and I hold the Van Beinum second only to the Szell/Cleveland Orchestra performance which remains my benchmark after 37 years. The beauty achieved by Szell in the slow movement remains unmatched for me on records (and I have many of this work) and the orchestra plays with the rich sonority one might associate with Chicago. It was one of his last recordings and the work was close to him over the years. It's a jewel in a discography filled with treasures. I am also a great admirer of van Beinum. It is a pity that he didn't record all the Symphonies, because I am sure that he would give the best versions of the First, the Third and the Null. His 8th his very powerful, with an extraordinary energy and also a perfect articulation. Perhaps the Adagio has not the beauty and mystical emotion of Jochum (BPO, 1964) but the Finale has a greatness that no one ever reached. I recently acquired the Skrowaczewski cycle, which I like a lot! I have very little comparison though, having only once borrowed the Jochum/DGG cycle before. The Skrowaczewski cycle was recommended to me by a friend, who has been into Bruckner for a few years, as the best place to start. 5--Furtwangler, but really for an extramusical reason. I have a performance from October 25 & 28, 1942, and October 25, 1942 is the day I was born. 9--Giulini is good, but my favorite is Mravinsky. One feature of van Beinum's Bruckner 8 which has affected how I hear the piece is that he used the first Bruckner Society edition, by Robert Haas. This is the one that restores parts of the finale that Bruckner cut when preparing the otherwise definitive last edition. Haas has been superseded by Nowak, for scholarly and perhaps also political reasons (Haas was on the wrong side in the '30s and '40s), but musically I think the cuts are structurally damaging and need to be undone. Certainly with van Beinum there's little danger that the finale, restorations and all, will feel too long! John F wrote: One feature of van Beinum's Bruckner 8 which has affected how I hear the piece is that he used the first Bruckner Society edition, by Robert Haas. This is the one that restores parts of the finale that Bruckner cut when preparing the otherwise definitive last edition. Besides restorations, Haas also composed passages and inserted them. I don't like some passages in his edition as they seem to come out of the blue and sound wrong, but they are about 98% the same. The Nowak Edition sounds leaner(granted, I imprinted on Nowak with Szell). But Van Beinum's recording is a great one. I'll mention another Bruckner 8th played by the Leipzig Radio SO conducted by Herbert Kegel on the now-defunct Pilz label which I found a few years ago in a cut-out bin. I picked it up for a couple of bucks only because it was the 8th on a cheapie label, but when I heard it I was astonished by the quality of the performance. I rank it right up there with the very best of 8ths. The recorded sound is also excellent. As a result, I bought a set of Kegel's recordings of symphonies 3 through 9 with the same orchestra from BRO on the ODCL label; they're all live performances except for the 7th. The 8th is not the same performance as the one on Pilz. These are all decent performances and it seems Kegel was considered to be a fine Brucknerian in East Germany but was not very well known in the west. Kegel committed suicide at the peak of his career shortly after German reunification for reasons I haven't been able to discover. Bruckner---more even than other late 19th-century symphonists---needs a more reflective, soulful approach. Those are both extreme examples, and both are antithetical to good Bruckner playing. I didn't care much for the Bruckner I've heard from him, either. I used to think it was the orchestra until I heard recordings by Giulini and Barenboim. I'd like to give his VPO 7 and 8 a try someday if I could find them cheap. The Solti recordings I like best are his analog ones. Somehow, most of his digital efforts, especially with Chicago, are pretty bad to my ears. Having said that, I wouldn't mind tracking down his Bruckner 2nd again. I had it ages ago, I'd be curious how it sounds today. Tastes change, and while I thought others beat it well enough to trade it in, sometimes I like to reevaluate things, too. They remain competitive and comparable. Perhaps a slight edge goes to the EMI box. Don't be put off by reviews that point to "older sound". The set is gorgeous in its sound. Both sets are. I have a special fondness for symphonies 4 and 7, which receive most airplay in my listening room. But I enjoy the 5th and 8th greatly, too. The 9th proves in a class by itself. But my single favorite Bruckner recording remains the Max Rudolf/Cincinnati Orchestra reading originally released on DECCA black vinyl. Thankfully Haydn House has released a CD transfer from reel-to-reel tape of this classic, and for the twelve bucks price tag it's a steal. You won't believe the brass on this one! I have several Bruckner complete sets and several dozen individual readings of various of the Bruckner symphonies ... the Max Rudolf disc remains the single most played Bruckner recording on my home stereo equipment for the past ... many years. I have the EMI set (displayed graphically above), and the Skrowaczewski/Saarbruecken set previously mentioned, and I love them both. I'd wanted a new copy of the Giulini/VPO 8 for some time, and finally found one at hmv.co.jp. It was worth the extra cost. pizza wrote: Those are both extreme examples, and both are antithetical to good Bruckner playing. I don't find the styles extreme, just very different. I don't find Solti's "keep it moving approach" to be extreme at all. it makes sense, and to me, works quite convincingly. I think the Teutonic belaboring of every phrase, every note to be pretentious, ponderous and logy. it works as a great soporific for me. I feel the same about Wagner, also - the best Wagner conductors, to me, are non-Germans, who are not so obsessed with the Teutonic "mystique", spirit and all that metaphysical baggage that so preocupies the Germans. I bought a copy of the Jochum box set today and I really like it. Val mentioned Jochum's recordings with the BPO so I willl try and get them too. Before Christmas the Haitink recordings were readily available but I couldn't find them today. Celibidache and Guilini are on my list too, actually the flipping Bruckner list is endless. Last edited by Seán on Sat Feb 16, 2008 7:53 pm, edited 1 time in total. Seán wrote: ... I deliberately avoided buying a box set when on my Mahler quest but buying the Jochum set of Bruckner symphonies looks like a very good idea to me. I'll check out the Rudolf cd too. Thanks for that. I'm not a big fan of boxed sets, but if you're going to do it with Bruckner, Jochum is a good choice. A good comparison to see if you prefer the slower, cathedral style of Bruckner or the more direct, aggressive approach would be the Karajan 4th that you have (I'm assuming it's the EMI recording) and the one by Jochum (I prefer his DG recording, but the one in that EMI set is also good). Last edited by Barry on Thu Feb 14, 2008 5:52 pm, edited 1 time in total. 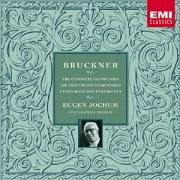 I'm not a big fan of boxed sets, but if you're going to do it with Bruckner, Jochum is a good choice. Really? I've never heard that said, and Deryck Cooke mentions no such thing in "The Bruckner Problem Simplified," which goes fairly closely into the differences between Haas's and other editions. He does mention that "Haas restored more than material--what he considered felicities, which had been spoiled in the revision. A dangerous undertaking, no doubt, and yet his score always seems the more Brucknerian." And Cooke gives examples from the first and third movements. Could you give an example or two of music actually composed by Haas, not just retrieved by him from the unrevised first version? I'd be very interested to know. I don't have a score for the 8th and I'll have to check my references where I read of Haas' composing. The source seemed credible to me when I read it. A quick check of Wikipedia might shed some light. The most significant omissions that Bruckner made (and therefore of Haas's restorations) are in the Adagio and Finale of the work. In addition, Haas inserted eight measures into the finale that he appears to have composed himself by combining the harmonies of the 1887 manuscript with material Bruckner penciled into the margin of the 1890 score, discarding five measures of Bruckner's own music in the process. There were no footnotes or other indication in Haas's edition that these changes had been made. This has been described as "exceed[ing] reasonable limits of scholarly responsibility". Despite its dubious scholarship Haas's edition has proved enduringly popular: conductors such as Herbert von Karajan, Bernard Haitink and Günter Wand continued to use it even after the Nowak/1890 edition was published, while noted Bruckner conductor Georg Tintner has written that the Haas edition is "the best" version of the symphony and referred to Haas himself as "brilliant". On the other hand, Eugen Jochum used Haas's edition for his first recording, made in 1949, before Nowak published his edition, and Nowak's for his subsequent recordings, while Wilhelm Furtwängler, despite having given the premiere of the Haas score, reverted to the 1892 edition in his final years. This isn't where I read it, but it does provide some detail for further digging. Seán wrote: I bought a copy of the Jochum box set today and I really like it. Val mentioned Jochum's recordings with the BPO so I willl try and get them too. Before Christmas the Haitink recordings were readily available but I couldn't find them today. Celibidache and Guilini are on my list too, actually the flipping Bruckner list is endless. That's what amazes me about Bruckner, and music in general: that you can take a certain set of notes and interpret them so differently. Celibadache's Bruckner is a very acquired taste, but for me it works. If you haven't sampled any from the library or elsewhere, I might suggest you purchase one or two before getting all of Celi's. The slow tempi may turn you off. Since they aren't cheap due to their length, (a few are on two discs), you may opt for just trying one out. On the other hand, Schuricht, did a Bruckner 8th with the VPO which was only about 72 mins vs. Celi's approx 100 min performance! But even though I ended up selling both, (after keeping my backup), they're both fine performances.